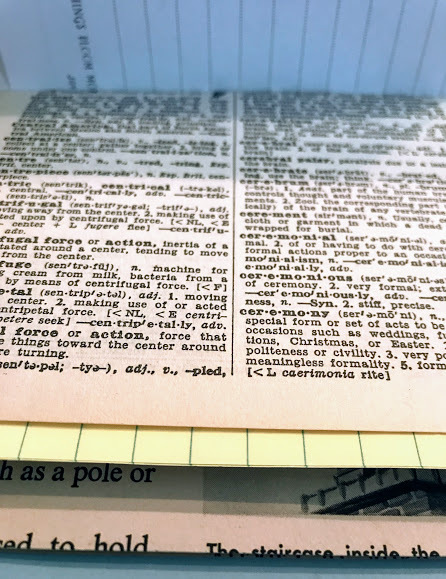 For years, I tucked away my memories in albums, then indexed them in boxes, and finally resorted to unsorted piles. This was not an efficient way to recall lifetime events. The iPhone, has made it much easier for me to capture and store memories. Years ago when my family went to Disney World, I heard a catchy song, Makin' Memories. As the song says, "Taking pictures is making memories, catching little pieces of time, making them yours, and making them mine...Celebrations we can forget in a year. When we're making memories happiness can reappear." Photos do make happiness reappear so last night after returning from my family and extended family trip to Cape May, I diligently edited my photos. Each time I added a new photo, another memory from the trip was recalled. 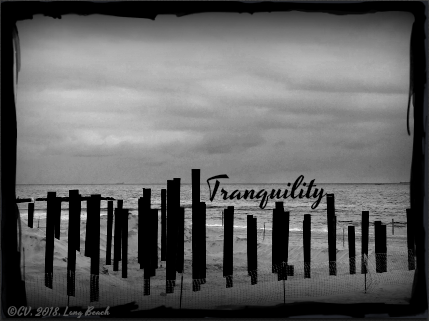 I lingered in those memories that included many shots of my precious little grandbaby at the Jersey shore. 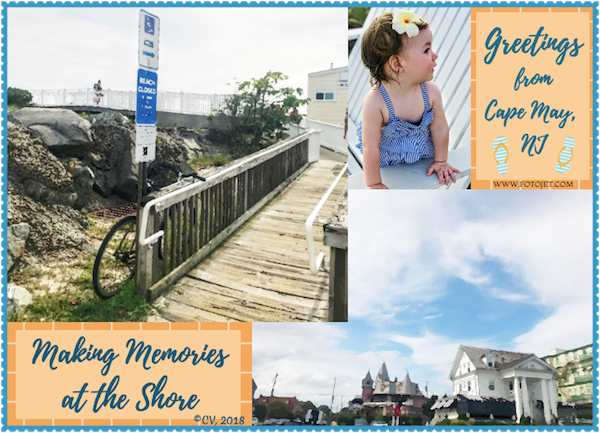 What memories have you captured with your camera this summer? 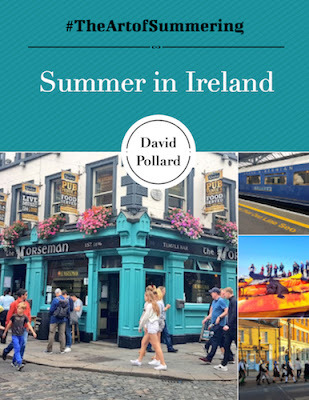 Does each one add to your concept of summering? 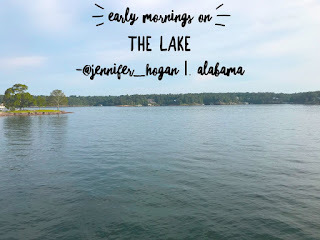 Here is my morning Instagram post with one of my memories that was digitized. 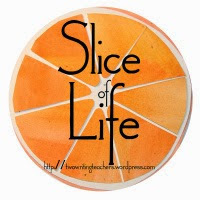 Join me to read what others are slicing about. What a beautiful quote this is. 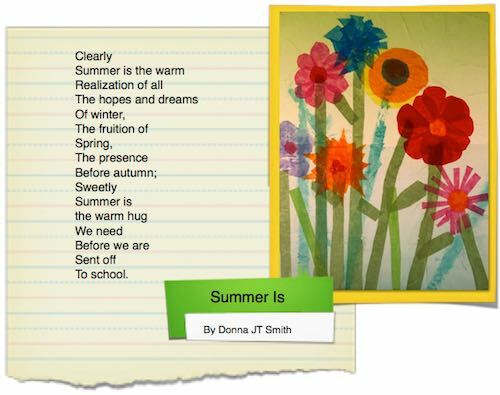 Art and poetry are often paired when creating image poems. Can you visualize an array of heart-centered colors swirling and brushing across a page surrounding poetic thoughts? from what I notice and wonder about in nature. 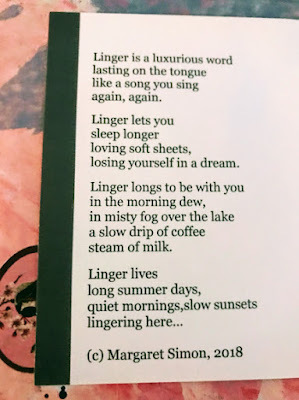 Poetry exchanges are one way to stay in touch with poetic friends around the globe and be creative at the same time. 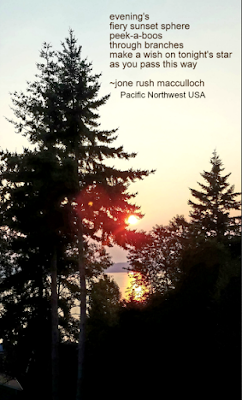 When my poet/slicer friend, Jone MacCulloch, emailed that she was sending me a package in the mail, I was ready for one of her vivid photographs but this line that she wrote added a sense of surprise to the expected package. 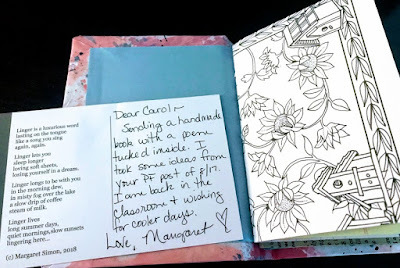 Jone said, "It (the poetry swap) was inspired by your grandgirl." Are you as curious as I was about what was to arrive? While Jone's quote, "Camera in hand/endless paths to wander/words arrive on wings," was not part of the swap, I wanted to include it because it conveys such a powerful message of what Jone's blog offers. Now, it's time for the reveal of what Jone sent me. 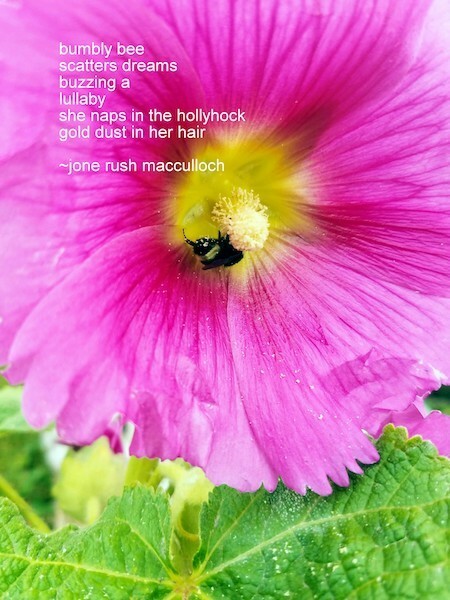 It was a stunning framed close-up of a bee scattering pollen with a beautiful poem that paints a picture of summertime in action while alluding to my grandbaby's naptime. 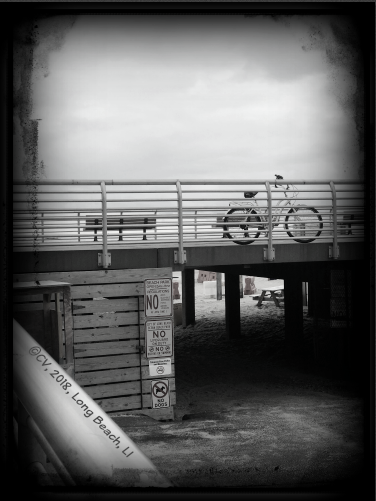 With camera in hand, Jone created the following digital inspirations for my upcoming gallery, TheArtofSummering. 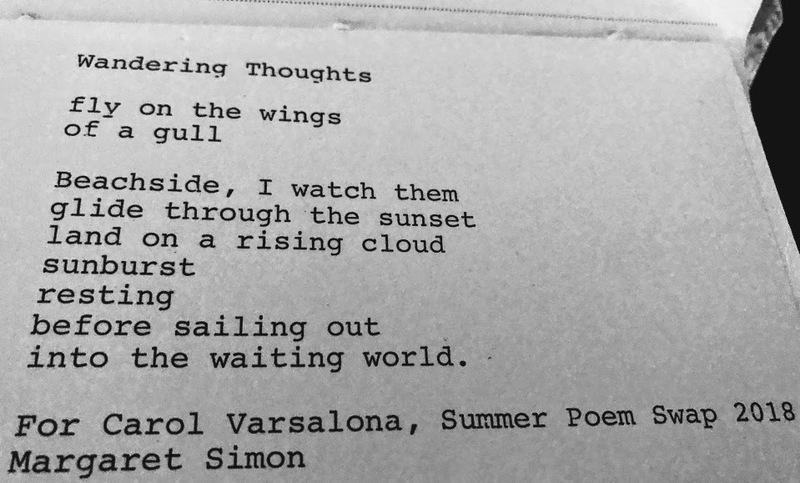 Next week, I will showcase Margaret Simon's summer poem swap that I received yesterday. 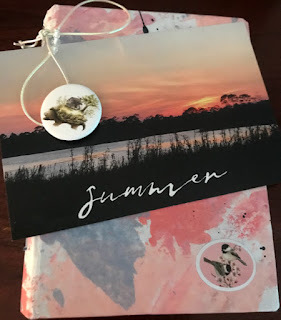 For now join me at Margaret's blog , Reflections on the Teche, for the Poetry Friday Round-up where she shares some of her Louisiana charms with us. 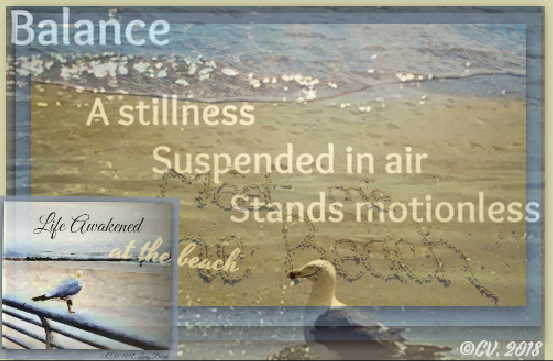 On September 7th, I will host Poetry Friday with hopes of having The Art of Summering Gallery ready for an unveiling. 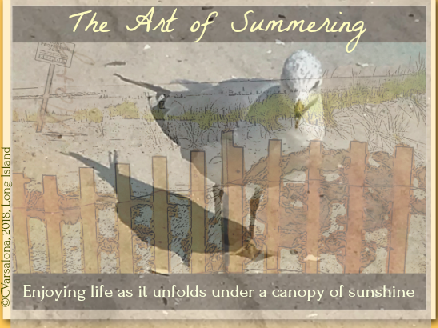 Please join my CREATIVE CHALLENGE to create your concept of "summering" digitally. 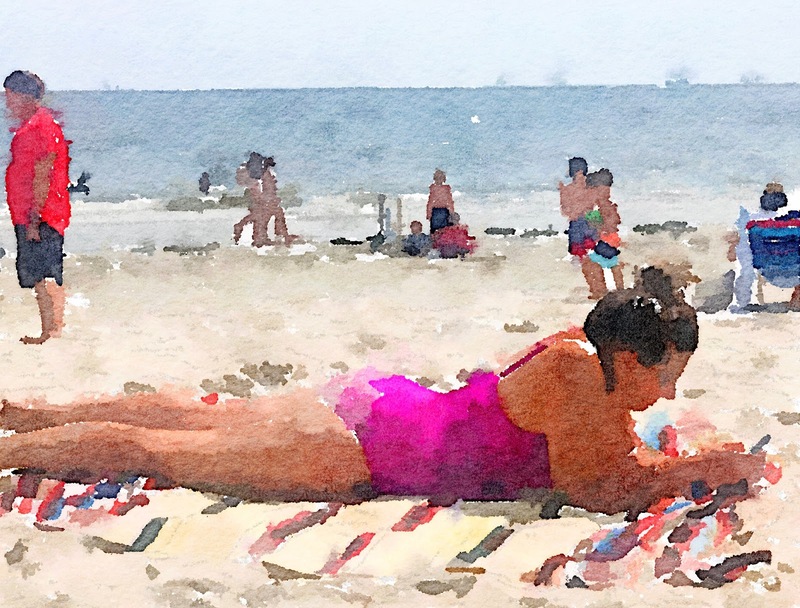 When dark clouds rest heavily across a summer sky, many beachgoers are dissuaded from traveling to the shore but today the beach lured me closer. 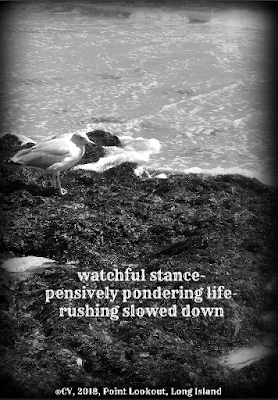 or a desire to be part of the sea's mystery? 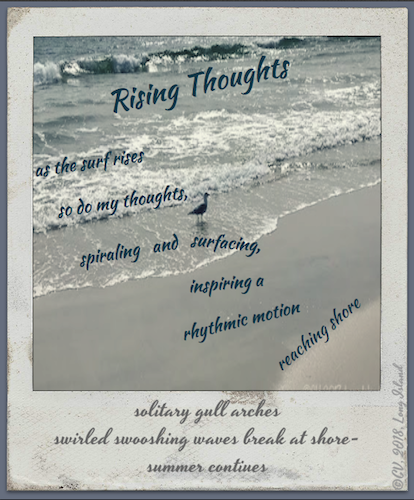 When was the last time you took time to quietly watch waves move in undulating motion or fall into tranquility's arms? No matter where you live, take time to transport yourself to water's edge, listening to the gentle sounds of nature. *The black and white photography will be shared at #TheArtofSummering Gallery next month. 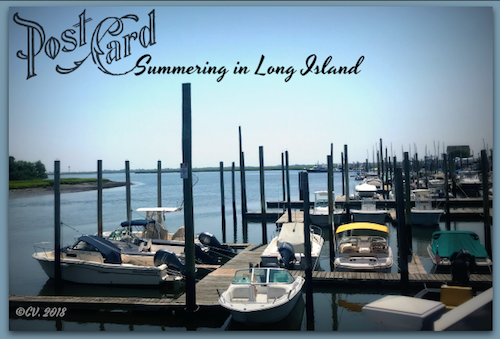 practicing the art of summering. As they swoop down to grab lunch. 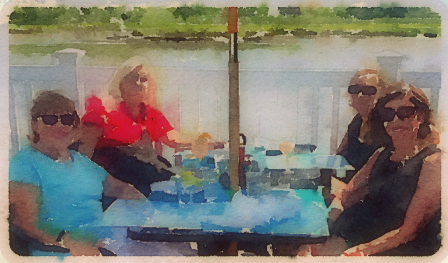 reflect on the art of summering. 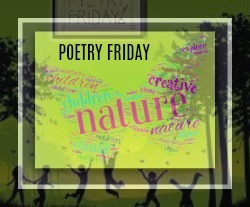 Poetry Friday is hosted this week for the first time by my writing friend, fellow Wonder Lead Ambassador, and resident ornithophile, Christie Wyman. 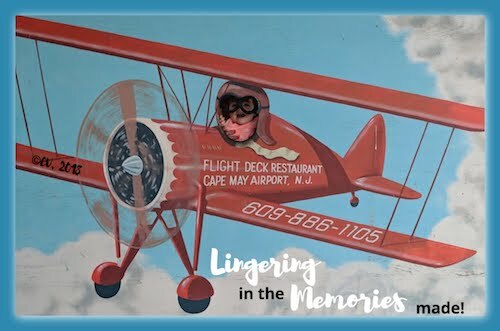 Christie offered a bird-related poem challenge for anyone who was willing to fly along with her. 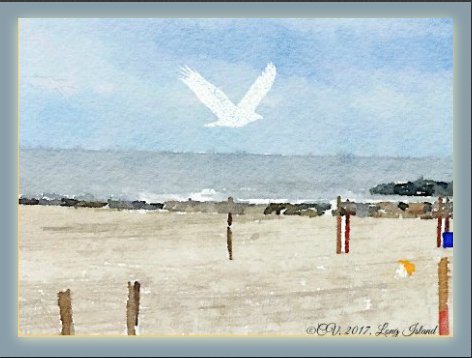 Since I am immersed in the collection of digital inspirations for my summer gallery, The Art of Summering, I wrote about the beach with its pensive seagulls who can be a raucous addition to the beach scene. 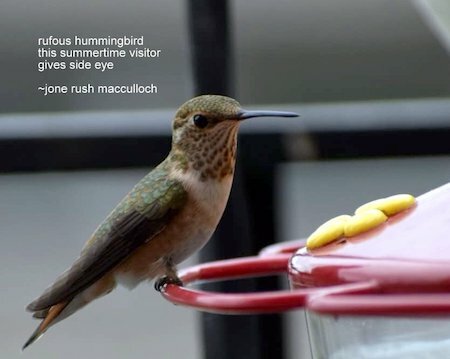 You can see Christie's Padlet of fine feathered poetry here. 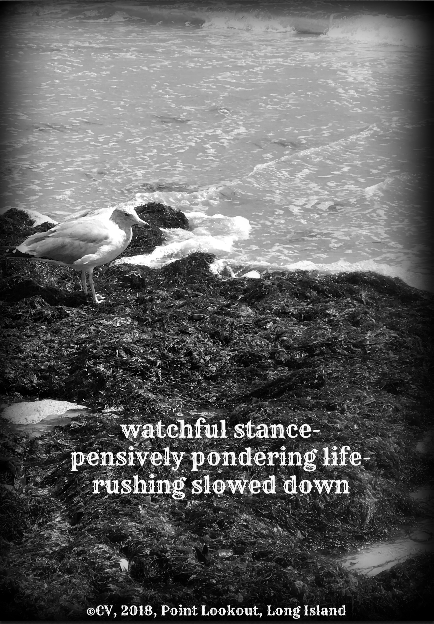 Recently, I watched my grandbaby gingerly rise and take a few cautious steps across the deck. Then, she plopped down. She rose, tried again, and we all clapped. She was determined to triumph on her way to mastering walking. We recognized and acknowledged her efforts as a life step in learning. As we move into the new school year, I recall this event and am reminded that we, as educators, parents, and grandparents, need to be the champions of our children. 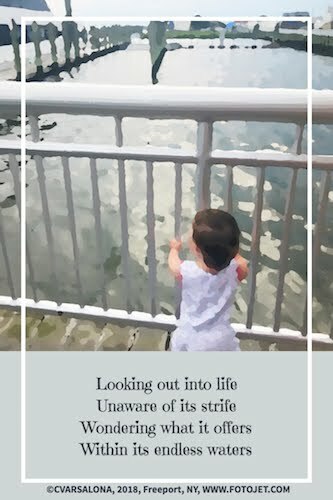 We encouraged our little one despite her many false attempts at walking while guiding her on, and applauded her attempts to become a walker. She knew she was in a safe environment with people who cared for her well-being. So too, in the classroom, educators as positive role models and influencers, need to watchfully observe students' movements, encourage their attempts to succeed, and celebrate their milestones. In turn within a culture of trust, students must find their stride, aim for a goal, and move gingerly toward its completion. At the start of school each year, educators, guides on the journey of learning, bring their passions and dreams for a hopeful future. They steer the ship to cross endless waters with their students bringing them the joys of lifelong learning. 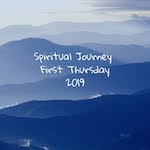 Are we ready for this journey? I see that many educators on social media are either already embarking on a new year of exploration and discovery or just about to start their school year. Let's navigate through clear and muddy waters to #StartStrong! Do you remember when you were little and the annual back-to-school question was "What did you do on summer vacation?" On #nt2t yesterday morning, Jeremy Bond, my Twitter friend, posed this as one of the questions for the global audience. In addition, he posted, "Would you have students answer the question? Why or why? Would you ask a different question? Today, I am celebrating the art of summering in an authentic way, collecting and designing a gallery of artistic expressions. I am thrilled with the response I am receiving from colleagues around the globe. 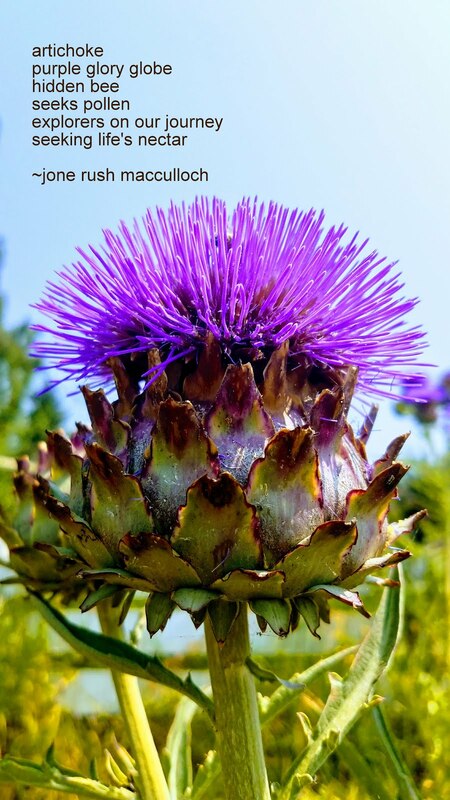 Here is a sampling of digital inspirations received this weekend. There are many more that will grace the walls of my summer gallery. Interested in depicting your concept of summering? 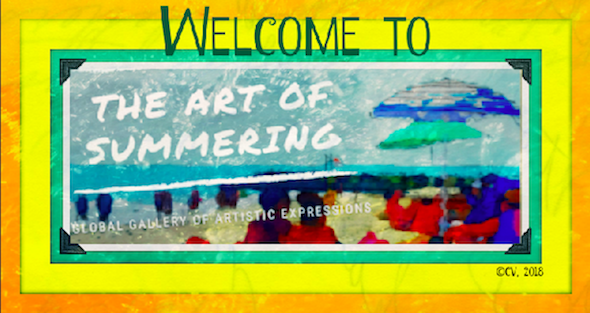 My invitation to The Art of Summering Gallery can be found here. 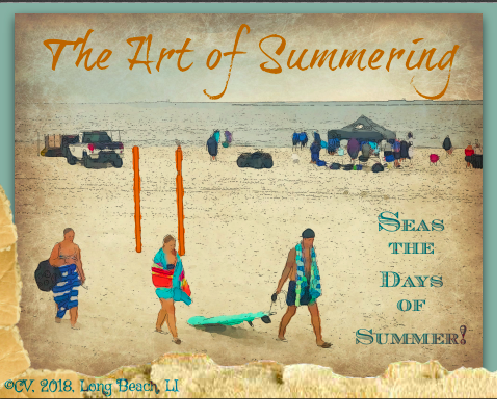 The repository for the digitals is on Twitter at the hashtag, #TheArtofSummering. 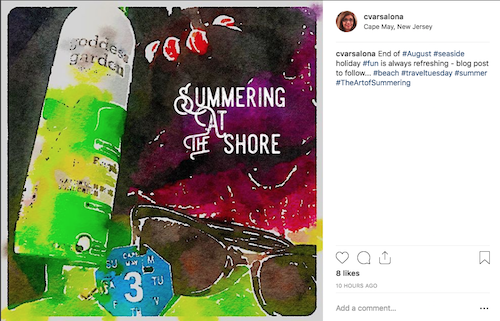 Come celebrate summer 2018 with me by letting your creativity shine. 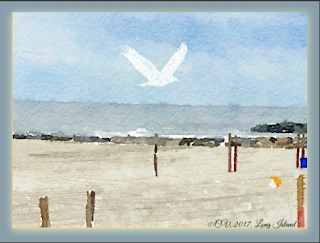 In return, I will celebrate your creative spirit and send the voices of those who create digitals around the globe. Many thanks to Ruth Ayres for creating #celebratelu to reflect and celebrate the positives of each week. Sylvia Vardell and Janet Wong's new publication, Great Morning! 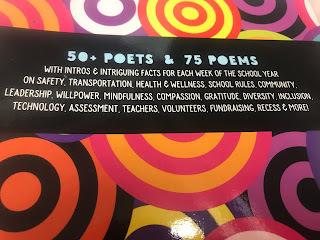 Poems for School Leaders to Read Aloud has been published. As a blogger on the Great Morning Blog Tour, I would like to thank Sylvia and Janet for their amazing contributions to the field of contemporary poetry. Their zest for writing and gathering poetry is exemplified by the variety of Poetry Friday anthologies they have created. 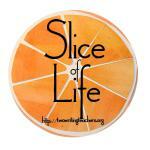 I am excited to promote their new creative endeavor, Great Morning! 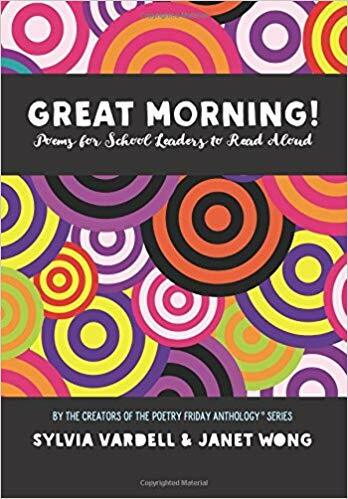 This book is filled with poetry in various formats about the different aspects of school life and specifically for schools' morning announcements. 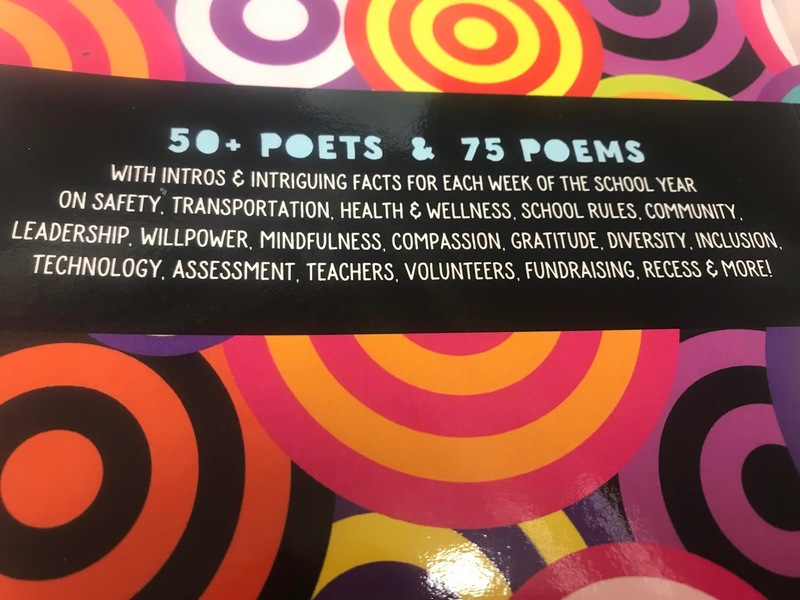 This is an ingenious way to spread the power of poetry throughout a building and a must-read for school administrators and literacy leaders. 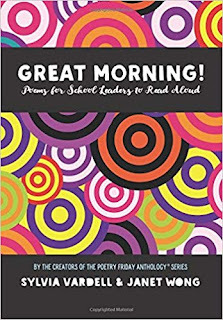 I am honored to be one of the published poets in Sylvia Vardell and Janet Wong's new publication, "Great Morning! Poems for School Leaders to Read Aloud". 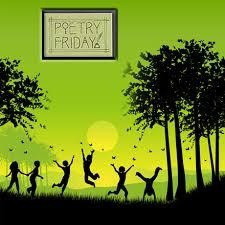 Being a member of the Poetry Friday family has enriched my artistic life and brought me full circle to one of the paths I chose as a young graduate student. Today, I present the inspiration behind the poem I wrote for Great Morning! 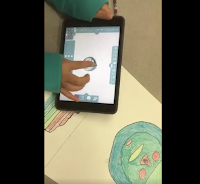 While pondering the topic art class for a K-1 audience, I called upon my connected educator friend, Matt Grundler, who is an elementary art teacher in Plano, Texas. 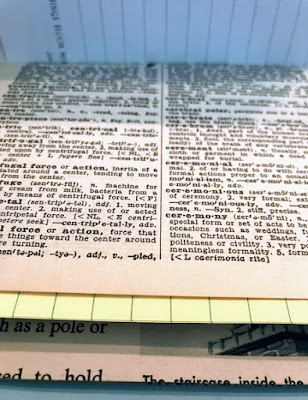 In addition to speaking with Matt for an hour, he sent me photos of his art studio and his students at work so I could gather my thoughts before drafting my poem for Great Morning! Below is a synopsis of the information I collected for my poetry writing task. 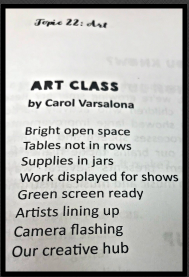 The Inspiration Behind the Poem, "Art Class"
Welcome to Mr. Grundler's Art Studio! Little hands make art weekly. curious students find their place on the rug. Their adventure begins with morning meeting. ready to start creative play. 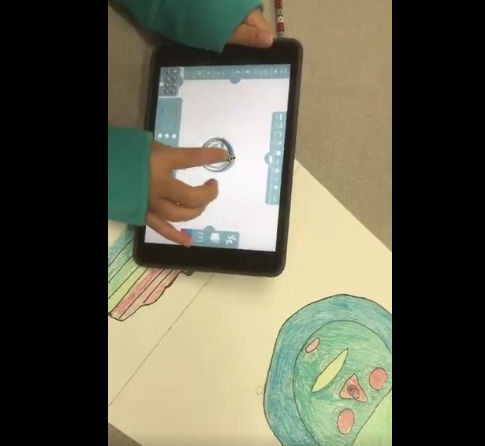 Sometimes, young artists collaborate to create. Other times, they work solo. waiting in the art room. 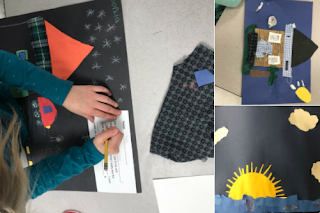 Collage making connects art and literacy. Matt Grundler breaks the stereotypic art teacher mold. 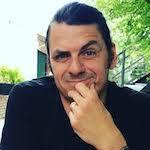 For one, he is a male in a predominantly female world of art teachers. 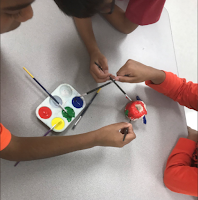 He is a minimalist with a bright, open-space design for his art room at Brinker Elementary School in the Plano Independent School District, Texas that has now transformed itself into an art studio for elementary children. 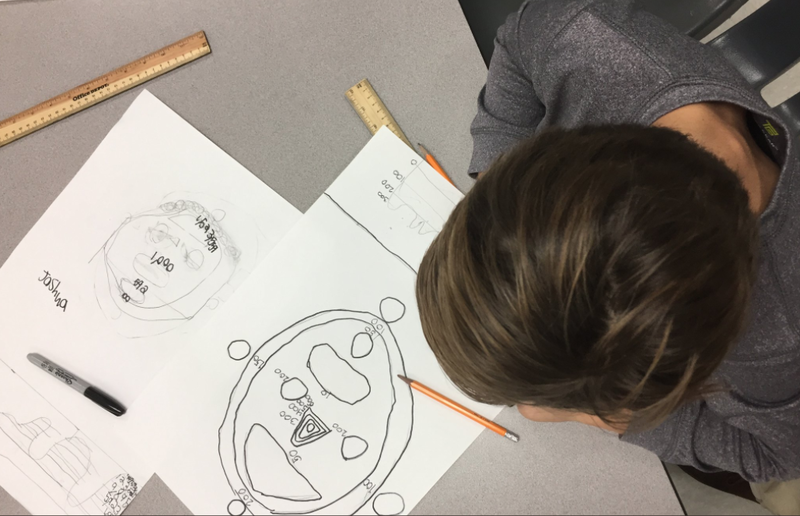 Matt, being an empathetic and compassionate teacher, models for his young artists and guides them on their journeys to find the artist within. 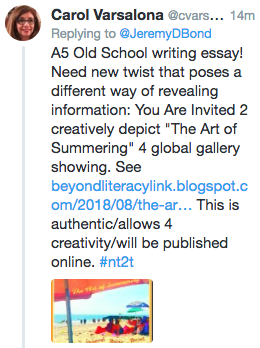 You can find this enthusiastic connected educator on Twitter as @ArtGuy76, the co-moderator of K-12ArtChat. Matt Grundler for making me see the gifts you encourage your students to bring to life. Sylvia Vardell and Janet Wong for inviting me to find my inner voice for this particular project. 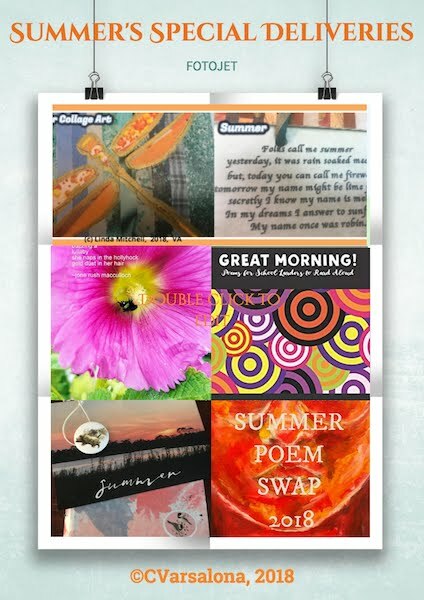 Pomelo Books for creating such a wealth of poetry resources for the educational world. The Poetry Friday Roundup is hosted by my writing colleague, Molly Hogan. Please join me as I visit Molly's blog, Nix the Comfort Zone, to read what she has in store for us.